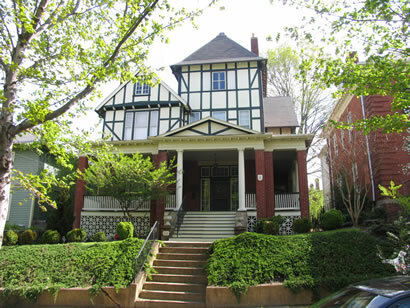 This house was built in 1907 by Hubert Watts, a private banker. Watts undertook the construction with his wife in mind. Unfortunately, beofre his dream could be realized, she passed away. Joseph Coleman purchased the home. The lot was part of the Diggs property, 117 Madison Street. The architecture is reminiscent of English Tudor and is one of the few such examples in the city. It has not been structurally altered since it construction.